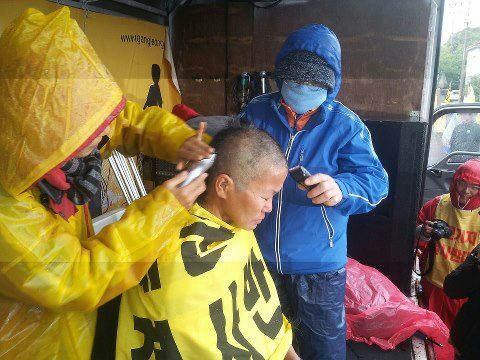 Photo by Jang Hyun-Woo, caption by Regina Pyon/ Jang Sung-shim (Catholic name Lucia) is shaving the head in front of Jeju naval base building site on 15th civic action day on November 10. 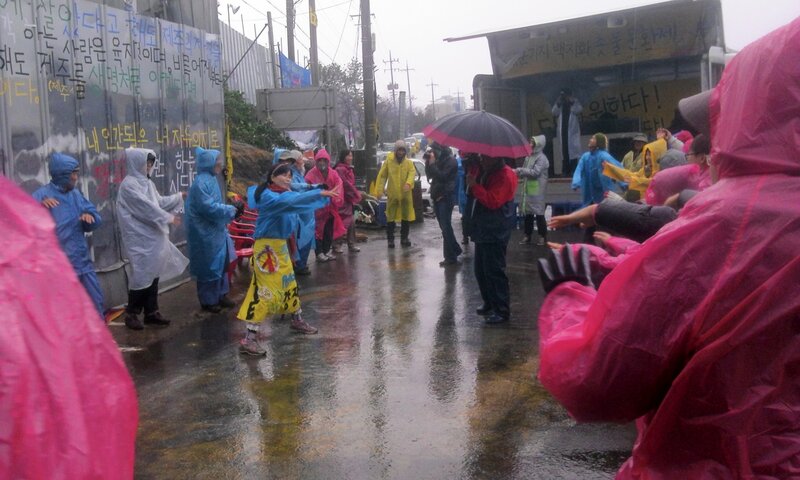 She was on her fourth day of fast even without water and salts staying day and night at the gate demanding the cancellation of Jeju naval base project. . . For more photos of Jang Hyun-woo, see here. 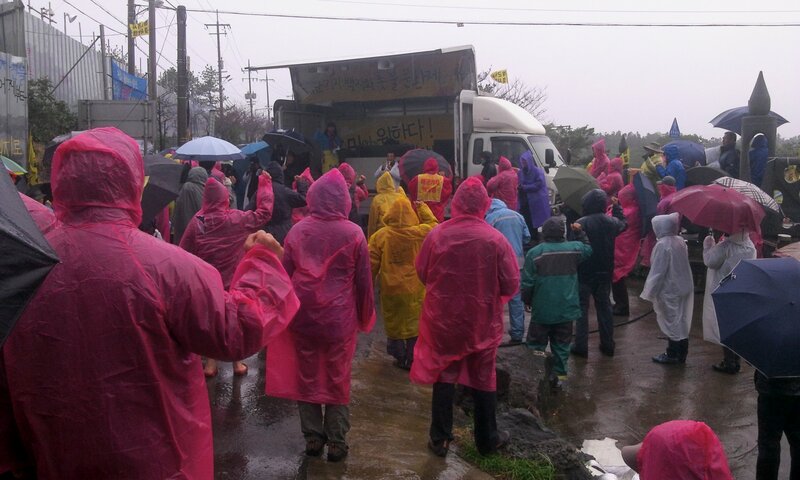 Rally in front of the Jeju naval base building complex, around 4pm. Nov. 10. 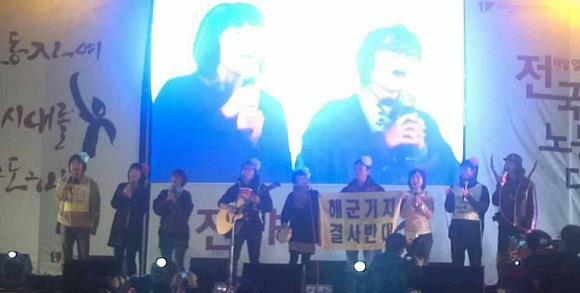 Jang Sungshim, a Jeju navtive and a Catholic follower who has been carrying on fast at the construction gate shaved her hair in protest to the enforced naval base project. In her ‘ statement on the fast and hair-shaving to revoke the US Jeju naval base project and to free all prisoners,’ she mentioned. Kim Jong-Il, former secretary of Solidarity for Peace And Reunification of Korea saying that the navy is enforcing 24 hour construction(destruction) to get the budget on naval base next year, emphasized the importance of current struggle to cut the budget, to form the ground for the revocation of naval base project and to totally re-examine the project. He said that the anti-base people will organize 14 teams and struggle to stop construction in twice shift in every 12 hours. 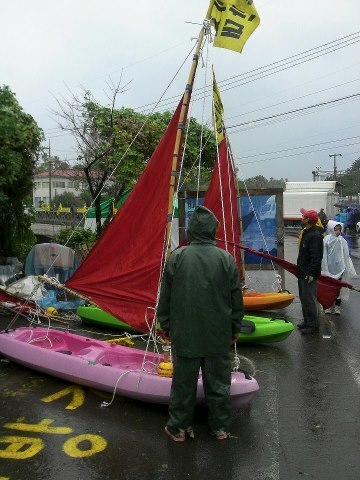 Photo and caption by Emily Wang/ Save Our Sea team’s beautiful sailing kayak in front of naval base in Gangjeong’s day. It’s much more beautiful, peaceful and useful for our lives than the warships. One builds up dreams and the other destroys dreams. 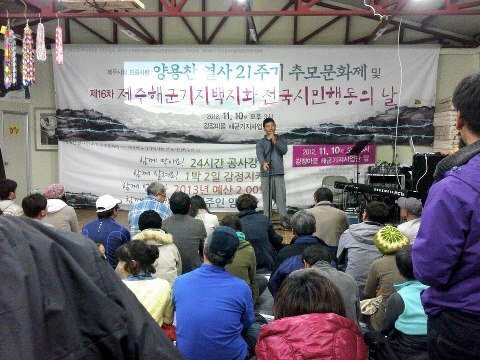 The commemorating event on Yang Yong-Chan was held indoor of the village Peace Center from 7 to 9pm because of heavy rain. Photo & caption by Emily Wang/ Today is the 16th Gangjeong’s day against naval base and also the 21st anniversary of Mr. YANG Yong Chan’s death. He sacrificed himself for the love of his hometown jeju island against the capitalism’s careless “Development Law” applied in the beautiful pristine island. His death couldn’t stop the “development law” but has inspired a lot of jeju islanders to love this land purely and bravely. 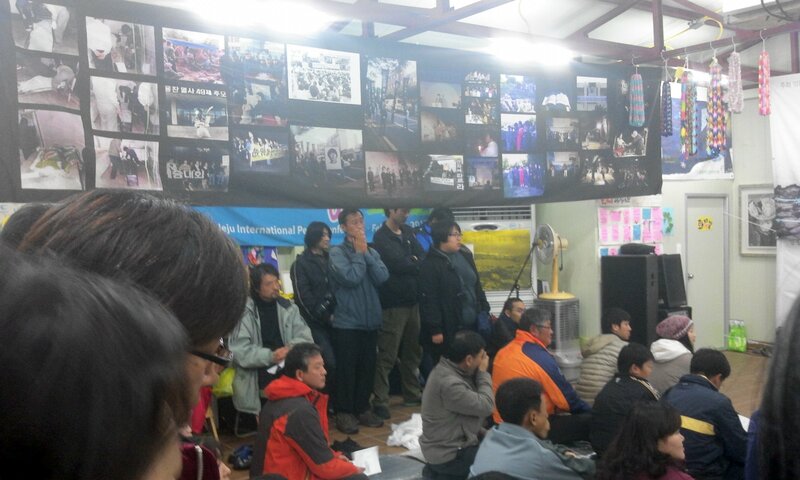 A banner that illustrates Yang Yong-Chan’s immolation in the City of Seogwipo in 1991 and aftermath with the collected photos.